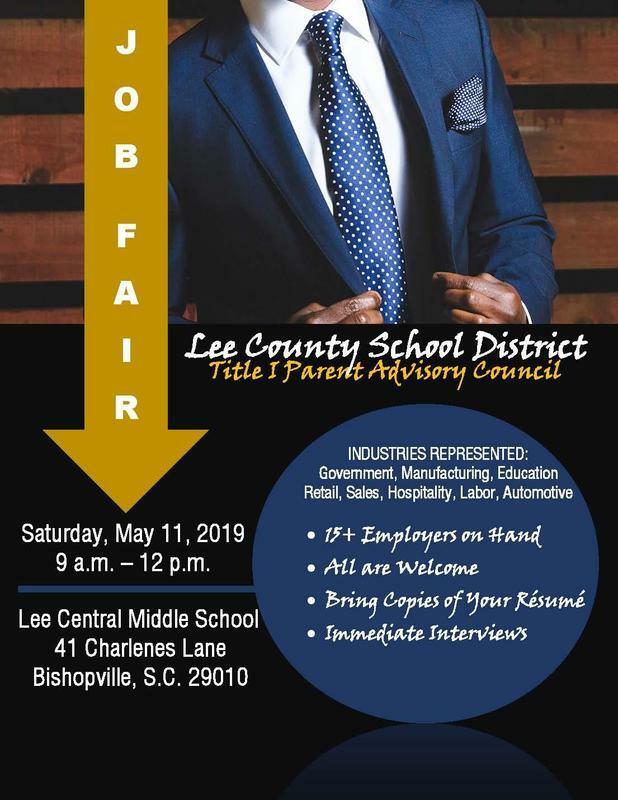 Lee County School District’s (LCSD) Parent Advisory Council (PAC) will host its inaugural job fair on Saturday, May 11, 2019 from 9 a.m. until 12 noon at Lee Central Middle School on 41 Charlenes Lane in Bishopville, S.C. There is a bit of a spin to this job fair. Lugoff Ford of Elgin, Lee County School District, Coca-Cola Bottling Co., Kentucky Fried Chicken, Lee County EMS, and Republic Services (landfill) all of Bishopville, the S.C. Department of Corrections of Columbia, S.C. and AllStaff Employment & Occupational Health Services, LLC of Camden, S.C. in addition to various others will be on hand to offer employment opportunities. The twist is there will also be students from Lee County’s Career and Technology Center (CATE) in attendance with booths set up to welcome prospective employers. It’s sometimes referred to as a reverse job fair where technical education students outfit industry specific booths to showcase their skills, portfolios and gifts to employers looking to hire skilled workers. CATE programs include agriculture, automotive technology, building construction, business education, cosmetology, early childhood education/teacher cadets, engineering/mechatronics, foods and nutrition, health science, marketing and welding technology. Parents and members of the community at large will also be in attendance, fulfilling a premise of Title I – to engage parents/families, communities and schools to work together for the education and equipping of students to become productive citizens. Those options could include Crown Health Care Laundry of Bishopville, Continental Tire of Sumter, Sonoco of Hartsville, S.C. and Weylchem of Elgin, S.C. who were all invited as well. For additional information about how you can participate in the job fair, contact Crosland at 803.484.5327.